The Tunesmiths from West Croydon, England traveled throughout the British Isles on weekends singing the great old gospel hymns and songs. Although all four men had the same last name, Smith, these old tyme songsters were from three different families and were not related. Delbert Smith (in white in the center) played the organ and occasionally sang with the others. 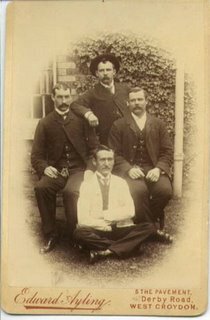 His brother Albert, in the back row, was an excellent baritone who also enjoyed a solo career and often performed at Albert Hall (what a coincidence?). Elmer on the left and Samuel on the right added incredible harmonies to the group. The group was formed in 1892 and crossed over to France for an evangelistic campaign in 1899 where thousands came to know Christ. I've been unable to find a CD of The Tunesmiths but their legacy lives on... in my mind at least...for, you see, I just concocted the story because I liked the old-fashioned picture. Get out your old hymnbooks, friends! P. S. Sorry, I couldn't resist doing this!